Professor Andrew MacLeod, BA/LLB, LLM, GAICD. Andrew is a recognised global leader, negotiator and communicator in the business, diplomatic and humanitarian field. He has a track record of leading organisations through challenge, crisis and change. Andrew’s foundation training was as a lawyer and Army Officer (Australian Infantry). His specialisations included International Shipping, War Crimes, Crimes Against Humanity and Genocide. For the International Committee of the Red Cross, Andrew set up and ran Law of Armed Conflict training with military units in Rwanda and former Yugoslavia during the 1990’s that saw a measurable decrease in civilian casualties. 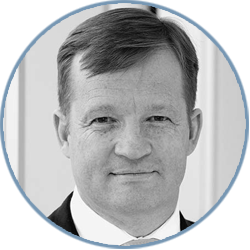 Andrew holds a Bachelor of Arts and Bachelor of Laws from Tasmania University, a Master of Laws from Southampton University, a Graduate Diploma in International Law from Melbourne University and is a Graduate of the Australian Institute of Company Directors. Andrew is also a Visiting Professor at Kings College London, an Affiliate Senior Associate to the Center for Strategic International Studies in Washington DC. He served on the Advisory Boards of the World Economic Forum’s Future of Civil Society Project Advisory Board, Kings College Humanitarian Futures Project, the UN Expert Group on Responsible Business and Investment in High-Risk Areas and is a Non-Executive Director at Cornerstone Capital where he has been part of the team overseeing growth from start-up to stability. While CEO of Committee for Melbourne, Andrew reversed three years of growing deficit to restore the organisation to financial sustainability. While Interim CEO of Good Super he re-established positive, working relationships with corporate regulators after the institution suffered ‘regulatory challenges’. Other positions have included GM Community Communications and external Relations for Rio Tinto where he successfully negotiated stakeholder arrangements for major infrastructure investment in Mongolia. Andrew maintains several senior corporate and charity advisory roles including Critical Resource UK, Gane Energy Australia and Backpack Beds USA. His negotiation successes include time as Chief of Operations of the UN Emergency Coordination Centre in Pakistan, where Andrew negotiated a complex series of relationships that saw the Pakistan military, international NGOs, UN agencies, US military, UK military and non-state militant groups all playing a role in delivering a successful operation without casualties or conflict. The costly intervention kept 3.5 million people alive during a six-month Himalayan winter whilst staying under the $600 million plus budget. The innovative model of ‘Non-Interfering Coordination’ has been documented in both The Pulse of Humanitarian Action (Fordham Press) and The Liaison Volume IV Issue 1, Centre for Excellence in Disaster Management. Andrew is a strong communicator having appeared as an expert on television and radio programs. He has been published in journals and newspapers internationally on areas of corporate reform and profitability, stakeholder management, leadership, negotiations, global affairs, security and terrorism. He is the Author of the book A Life Half Lived (New Holland Press) and he is a sought after corporate speaker internationally. Andrew received the Humanitarian Overseas Service Medal by Australia for work in the Balkans and was awarded a second time for work in Rwanda. He received the Australian Defence Medal for service as an officer in the Australian Infantry. He was awarded the Silver Medal for Humanity from the Montenegrin Red Cross and was recognised by the Australian Government for his work in East Timor. Andrew was awarded as a Vice Chancellor’s Distinguished Fellow at Deakin University in 2016, the 2014 University of Tasmania Foundation distinguished Graduate Award, the 2013 Young Britons Foundation Global Leadership for Freedom Award and the 2008 Australian Davos Connection Leadership Award, amongst others. Andrew was also a world-class swimmer having won a silver medal for the 200 meters Butterfly at the 2002 World Masters Games. He regularly volunteered to help national swimming teams in the developing countries.